One of local barbecue restaurants I frequent has a plate called the pork three ways that includes pork ribs, pulled pork and pork sausage. I mention this fact not to make people hungry for barbecue pork, but to point out that sometimes it is hard to pick a single entree leading to the need to combine things into a single meal. In that same spirit we are going to focus on three entrees from the world of baseball since focusing on just one would not do justice to the other two, much in the same way that just getting ribs leaves out the pulled pork and sausage. Our first entree comes to us from the Houston Astros who stepped on a player’s moment to create a look at us moment Monday. For the first time in team history a member of the Houston Astros won a batting title. That player was second baseman Jose Altuve. Altuve not only had the best batting average in the American League but had the best overall average in all of baseball this season. Jose Altuve won the American League batting title this year and had one day in the spotlight until the team announced it had hired a new manager. 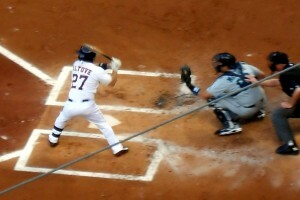 Altuve also set a new team record for hits in a single season. For a team that has known more about losing than winning the last couple of years this individual achievement by Altuve gave fans of the Astros something to cheer about as another lackluster season came to a close. Traditional wisdom would say that in a situation like this a team would give the spotlight to the player for a couple of days to give the proper attention to such a stellar achievement such as having the best average in all of baseball. Instead, the smoldering tire fire that is the Astros front office saw fit to take the attention away from Altuve less than 24-hour after the end of the season to announce that they had hired a new manager. The Astros certainly needed to fill the vacancy at the manager position. However, was the news that they hired a man with a losing record as a manager, who has been out of the dugout for four years, so important that they could not wait a day or two to announce it? Apparently in their minds it was and thus ended the spotlight on Jose Altuve. While the hiring of A.J. Hinch left many fans underwhelmed and thinking that the Astros should have hired a more established manager the fact remains that more established managers have enough sense to stay away from the Astros in their current state. 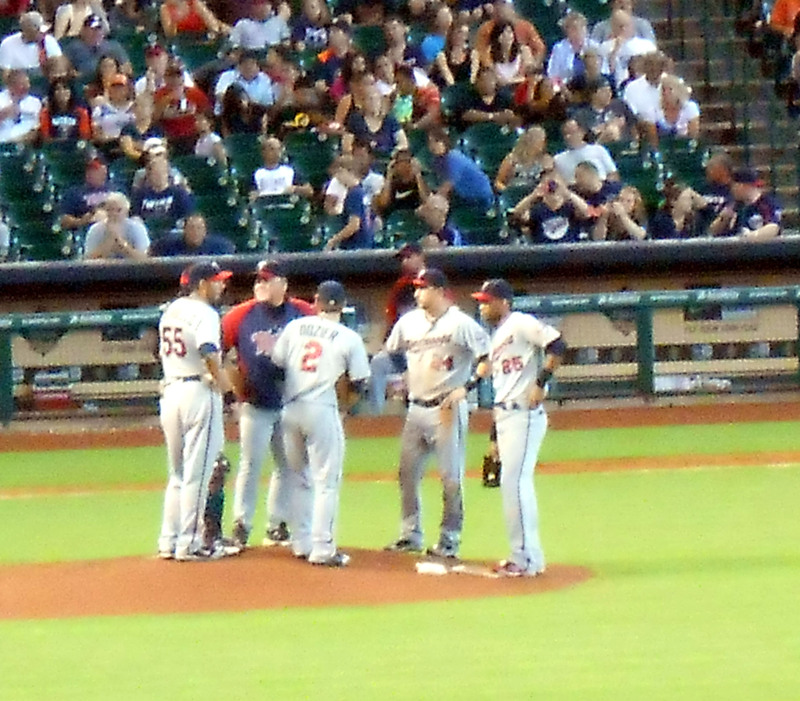 As for the manager the Astros did get, Hinch managed the Arizona Diamondbacks from May 2009 until July 2010, and was fired after a 31-48 start. Hinch served as the vice president of professional scouting for the San Diego Padres from 2010 until this past August. Not a very successful resume at first glance, but I will wait to see what he can do with his second opportunity to manage a big league club. Speaking of managers, our second entree takes us to Minnesota where the Twins fired longtime manager Ron Gardenhire after a fourth straight losing season. While I do not follow the day to day operations of the Twins as closely as I used to, I have been a fan of Ron Gardenhire since his days as the manager of the Orlando Sun Rays of the Southern League. Ron Gardenhire spent nearly 25 years in the Minnesota Twins organization including the last 13 as manager. As mentioned before I attended many Minor League Baseball games growing up in Orlando and several of those years were spent pulling for Gardenhire led teams at Tinker Field. All in all Gardenhire spent around a quarter of a century within the Twins organization, including 13 seasons as manager, and was there for much of the teams success. Unfortunately in a what have you done for me lately world, past success can only go so far in covering up current problems. The Twins offered Gardenhire a front office position which he declined stating that he feels that he still has things to offer as a manager. Personally I would not mind the Texas Rangers giving the reins to Gardenhire if for no other reason than to say that he managed both teams that used to be known as the Washington Senators as the Twins leaving Washington D.C. for the twin cities paved the way for the expansion team version of the Senators that became the Rangers. Even if Gardenhire does not end up with the Rangers I have little doubt that he will end up in another dugout before too long. Our third baseball entree takes us to Sugar Land where the Skeeters are hosting the first two games of the Atlantic League Championship Series against the Lancaster Barnstormers. 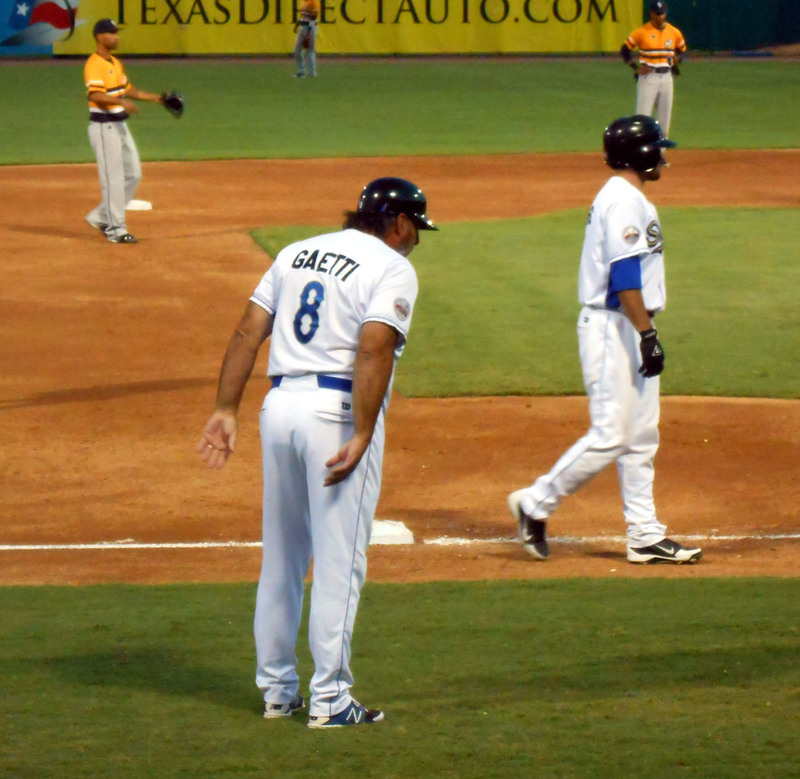 The series opened up last night with the Skeeters losing to the Barnstormers 10 to 6. Game two of the series is tonight and will find the Skeeters trying to even the series. Regardless of whether or not the Skeeters hoist the championship at the end of the year they can be proud of what they accomplished this year. 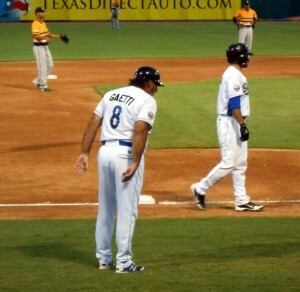 Sugar Land Skeeters manager Gary Gaetti led his team to the playoffs for the second straight season. The Skeeters opened the Atlantic League Championship Series last night. Among those accomplishments are hosting the All-Star Game in June, making the playoffs for the second straight year, and winning the first playoff series in team history against the York Revolution. There you have it, three delicious entrees from the world of baseball this week. As every good three meat plate needs a couple of side dishes, it should be mentioned that the Major League Baseball Playoffs kicked off last night with the American League Wild Card game between the Kansas City Royals and the Oakland Athletics and continues tonight with the National League Wild Card game between the San Francisco Giants and the Pittsburgh Pirates. Now if you’ll excuse me, all of this talk about entrees has made me a little hungry.